That’s fine – but what about more common disasters, like hurricanes, snowstorms, or severe floods? These could knock power and other services out for days or weeks, and you can’t count on running to the store beforehand to get what you might need. And what if a region-wide or nationwide pandemic strikes and you’re confined to your home? Or if the electrical grid fails at a fundamental level over a wide area? These events can strike with little or no warning. That’s why it’s wise to be somewhat prepared for a substantial calamity. One of the easiest and most basic ways to prepare is to stockpile food to have on hand in case you’re unable to shop for awhile. 1. Make space. Dedicate some shelving in your pantry or basement specifically for your stockpile. Wherever it is, make sure it is cool and dry; spaces that are too hot or cold may degrade your food quality. 2. Don’t bust your budget. While planning ahead is important, don’t do so at the expenses of your day-to-day spending. Just build your stockpile up a little more each time you go to the grocery or warehouse store. 3. Decide on size. 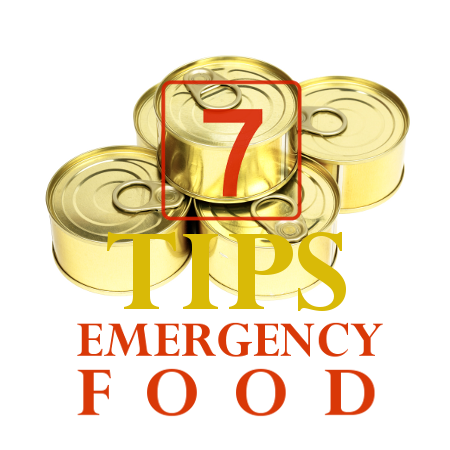 Federal agencies recommend that you keep at least three weeks of food on hand for emergencies. Use that as a starting point; then, if you wish, build your stockpile up even more. Here’s a food storage calculator to help you in that effort. 4. Look for deals. There’s no reason you have to spend a lot of money on your stockpile. Look for coupons, specials, or buy-one-get-one-free deals. And don’t be afraid to buy off-brand items if your family isn’t brand loyal. 5. Buy in bulk. There’s nothing wrong with buying five-, 10-, or 20-pound bags of staples. Or big-box store pallets of other foods. You’ll generally save money, and you’ll go a long way toward starting your stockpile. 6. Set a rotation schedule. Make sure you check expiration dates periodically. This can be aided by writing the expiration date on each food item in black marker. Once or twice a year, consume soon-to-be-outdated food items and replenish them. 7. Don’t forget your kids. Emergency or not, children may not want to eat certain foods if they don’t like them. So keep your kids’ preferences in mind when shopping. And consider different recipes to change how you serve the same staples. Don’t think of food stockpiling as emergency preparedness. If you view it as a semiannual preventive measure like changing your smoke detector batteries, you can more effectively manage your stockpile while maintaining the peace of mind that you are remaining prepared for almost any type of disaster. Chris Martin is a freelance writer who writes about topics ranging from how to remove articles from Google to when to switch auto insurance companies to what business software works best.